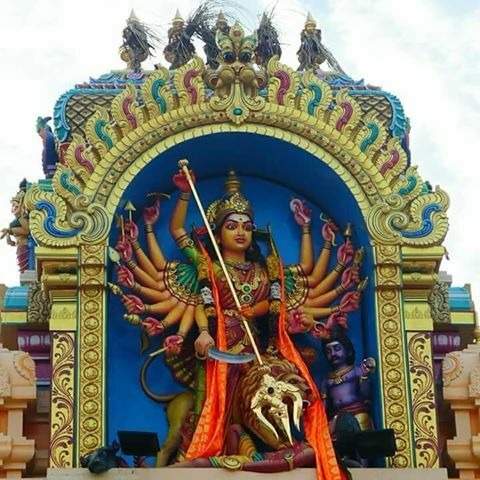 The Sri Pathira Kaliamman temple is located in the village of Sungai Pinang Kecil. It is an Indian (Hindu) temple. Many find it a special feature that the temple is so close to the sea. However, it is not so special if you know, that it was actually a temple for fishermen. About 150 years ago the Indians came to Malaysia to work on the rubber plantations. There were also Indians who became fishermen and went fishing. They built the temple for the Goddess Kaliamman, who would protect them from the turbulent, unpredictable, deadly waves of the sea. They had put down a 'trisulam' (trident), camphor, lime lamps, and flower offerings before going to the sea. After a good catch, there was usually an animal sacrifice, which is now no longer practiced. The temple has now been renovated and the faithful have placed a granite statue of Kaliamman under a "neem tree" (azadirachta indica). In the past, the image was slightly more close to the beach, so much so that during Amavasai (new moon) and Pournami (full moon) the sea breeze laid the silky sand of the beach on the blessed feet of Kaliamman. As with many temples, there are also beautiful stories here. There was once a blind man who lived near the temple and was very poor. One day the blind man heard a mysterious, raspy voice, which told him to light the oil lamps in the Kaliamman Temple. Then his blindness would be healed. He went to the temple and lit the oil lamps. After a while his blindness was completely healed. In gratitude he performed a "kavadi" (spiritual dance) at Kaliamman, during the annual Masi Magam festival. He did this every year until he died. 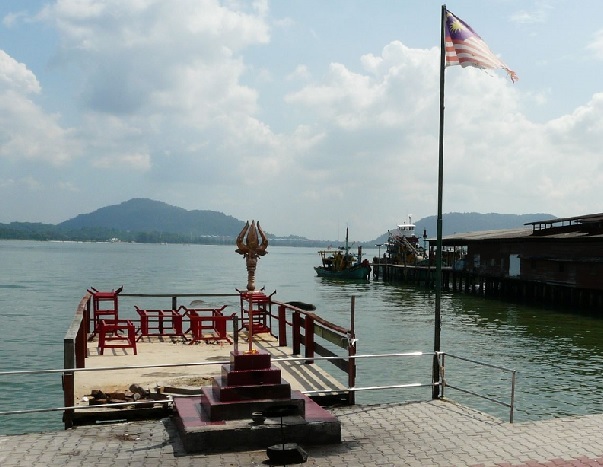 Another story tells us that the granite statue of Kaliamman was stolen by bandits and thrown into the sea. A believing woman dreamed about the stolen statue in the sea. She told this in the temple and she gave a precise description of where the statue could be found. Soon it was found and all believers were happy and gave her a party. Many believers have sparkling visions of this goddess. Some have seen her sitting on a rock, combing her deep black hair in the shining moonlight of Pournami and Amavasai. Others have seen a different appearance of Kaliamman, in the form of a little girl with silver anklets running in and around the temple. The most striking aspect of this temple is that the temple overlooks both the sea and the east. Thus the believers are blessed with the energy of the sun and have the opportunity to wash away the negative energy in the sea. 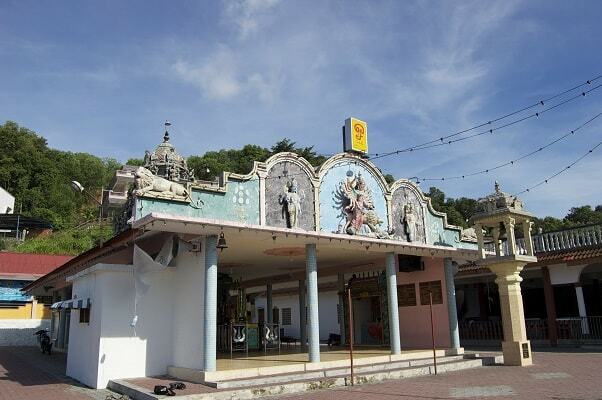 In addition, the temple has a 60 kilogram weighing 'trisulam' (trident) opposite the image of Kaliamman. This is forged from "aimpon" (5 metals). It is about 2 meters long and has images of the sun, moon, 27 stars, 12 moon signs and other sacred symbols. The highlight of this temple is during Masi Magam, where the annual festival of the temple is celebrated with great joy, pompousness and spiritual joy. During this annual festival, the deity is carried around the temple and taken to the sea to bathe in the sea water before returning to the temple. This festival is somewhat comparable to the Thaipusam festival . A striking feature of the Masi Magam is the number of Chinese believers who celebrate the festival. Many of them carry a kavadi (undergo physical burdens as penance: spears, arrows, needles ...) We see such cultural mixtures more often with Hindus at the Bay of Bengal. Kavadis zijn grote, versierde stellages, die gedragen meegesjouwd of voortgetrokken. Zie hiervoor het Thaipusam festival.